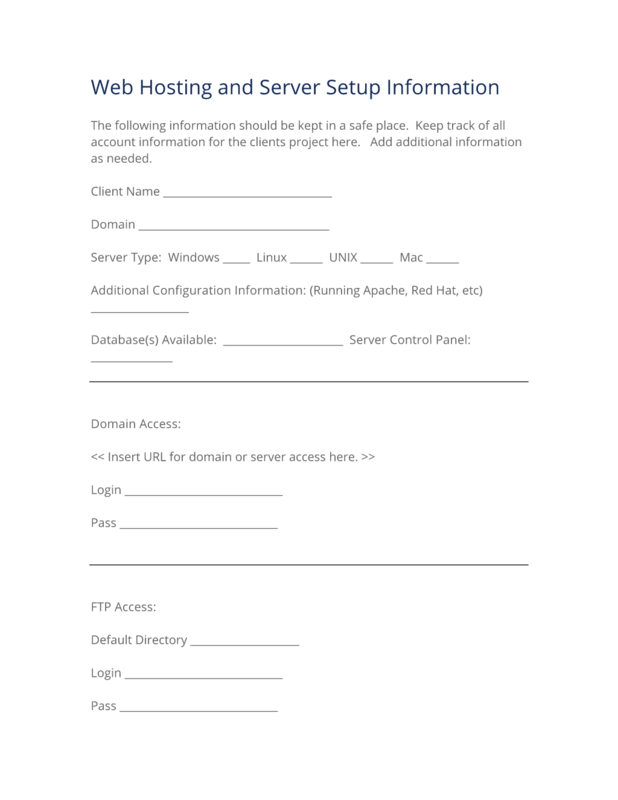 Use this worksheet to keep track of web site domain and related details about each project. If a project has to be updated in the future you may not always recall details such as login passwords, administrator URLs, etc. Use this template along with the Project Notes template above. been at the forefront of my business activities for over three years. No other product has contributed more to our successes and its ease of use a real time-saver." This Web Hosting and Server Setup is included in an editable format that can be customized for your own needs. The following information should be kept in a safe place. Keep track of all account information for the clients project here. Add additional information as needed. Server Type: Windows Linux UNIX Mac. Additional Configuration Information: (Running Apache, Red Hat, etc). Insert URL for domain or server access here. Example of a Note: Server requires outgoing authentication (You do not need to set incoming or "Secure Password Authentication" (SPA). Web Mail = Insert web mail or remote email information, if available to your client, here. Insert information about additional logins or passwords, links, Search Engine, Portal, Messages Boards, CMS (Content Management System) or any other information that the client may require. The editable Web Hosting and Server Setup document - complete with the actual formatting and layout is available in the retail Proposal Kit Professional.